As the resident nerd in my friend group and family, I’m frequently called upon for various freelance development tasks, whether it’s troubleshooting some finicky plugin or redesigning a blog for a friend. As such, I found myself waltzing into all manner of website builder interfaces long before I joined Digital Brands — before HostingAdvice even existed. Between those experiences and my day-to-day job requirements today, I’ve thoroughly enjoyed the industry banter about website builders. Some things I’ve learned: Everyone either loves or hates WYSIWYG, a very polarizing set of letters. Nobody wants a cookie-cutter layout. SEO is tantamount to a website’s success, and there’s a plugin for everything. It takes but two minutes researching the top website builders to stumble upon WordPress and Wix — but which is best for your next project? Let’s compare the two in an exhaustive review as I cover every facet of website building necessities. Feel free to skip ahead or jump around. Unless you’re just really lucky, building a website is pretty much meaningless without some understanding of SEO. Search engine optimization is how you capture the attention of popular search engines, like Google or Bing, and earning their favor puts your site on the radar of potential visitors or customers. SEO matters — so it’s become a hot topic when comparing site builders. A leading argument in WordPress.org’s favor is that the software comes with “cleaner” code out of the box. This makes sites easier for Googlebots to navigate, read, and judge for authoritativeness. Knowing what we know about optimizing your website for search engines, the more control you have over the content and structure of your site, the better. WordPress (the self-hosted platform, not necessarily the fully hosted online version; know the difference) gives users the utmost granular control over HTML, CSS, image attributes, design, and URL structure. Tools like these are what really give WordPress users the upper hand over Wix website owners. Not only are the SEO resources for WordPress abundant, but plugins and apps bring the WYSIWYG approach to an otherwise somewhat intimidating subject matter. Jeremy Wong brings up some great points: Using WordPress does not equate to ranking #1 in search results, and opting to use a drag-and-drop builder like Wix does not mean SEO doom. The best way to boost your rankings is through on-page optimization techniques like ensuring every page on your site only has one H1 heading, making good use of link anchor text and image alt text, and doing keyword research to craft the most in-depth, helpful guide on a given topic possible. None of these methods are WordPress-only techniques. Remember, Google has more than 200 ranking factors determining which pages to serve up to internet searchers and in what order. To Google, a website is a website. A WordPress site can be poorly optimized and a Wix website can be a top result for competitive terms. We advise Wix users to take advantage of the SEO Wizard to learn how to set your site up for success. No surprises here — the software powering more than 25% of websites and blogs keeps the lead. The WordPress interface is optimized for bloggers — beginning with the QuickPress feature for easy posting. The main navigation is set up in such a way that every blog-posting essential is right at your fingertips: add a post, upload media items, or adjust your blog’s appearance. Of the thousands of WordPress themes, hundreds market to bloggers, so you can quickly skip to the content creation portion of your site-building journey. We’ll hand it to Wix, the team has pulled out every stop to make starting a blog a quick and painless process. They strip away any of the technical nuances of building a site to deliver a beautiful, what-you-see-is-what-you-get blog-building experience. This all starts with a theme, of which there are tons of blog-specific designs. The Wix team has labeled the blog template options by topic, so you can quickly pull together a blog about food, travel, fashion, or whatever your heart desires. We give Wix two thumbs up for easy setup and ready-to-go design, but the lack of hands-on HTML/CSS customization is a downer, especially for folks who aren’t afraid to at least try to learn a little coding. We don’t like limits, but for a starter blog platform, Wix is a solid choice. Ah, what’s this? We’re about halfway through the race for website builder favor, and Wix has taken a bit of a lead. When it comes to online store building, Wix reigns supreme for technically inexperienced store owners. The setup is quick, and there are more eCommerce functionalities built into the Wix platform compared to WordPress out of the box. Best of all, Wix takes a whopping 0% commission on each transaction your online store makes. That is not to say that WordPress takes a cut, but it’s still a perk to hosting with Wix worth noting. Industry experts go back and forth between stances on WordPress for eCommerce. Arguments against it include: It’s not setup for transaction-based sites (you need plugins for product displays, payment processing, inventory tracking, etc. ), it’s subject to security vulnerabilities thanks to those necessary third-party applications, and its learning curve is too steep for the average store owner. Honestly, if you’re just looking to dabble in eCommerce — maybe throw some of your artwork up on the web and test the waters of a secondary income stream — you’ll do fine with Wix or WP. The point of differentiation comes when your business has outgrown a fully hosted environment like Wix. WordPress is better suited to growing a business beyond the startup stages — when you need more product pages, have more incoming customers/need more bandwidth, and expect more revenue (the goal of any business, right?). When the competition boils down to site building, the two opponents are at a stand still. One is more accommodating in the beginning, while the other delivers more advanced functionality for the long haul. In short, it depends on your level of comfort with website maintenance and expectations for your site and its service provider. 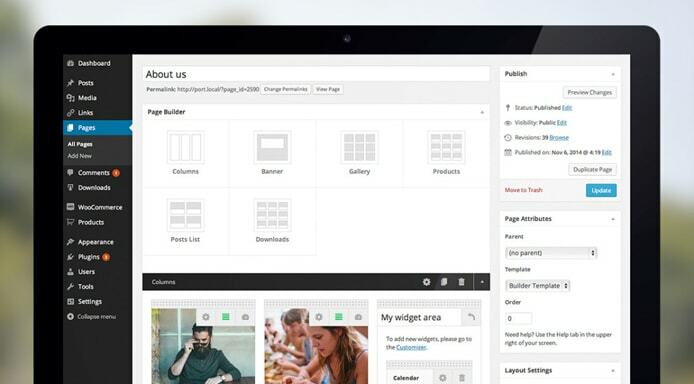 You won’t find a more robust website-building platform than WordPress software. When it comes to building a dynamic, multi-page site, whether it be for blogging, commerce, or an otherwise personal or professional brand presence, WordPress is king. There are some perceived downsides, but they can be avoided. The first caveat is one we’ve mentioned before: the learning curve. Well, Rome wasn’t built in a day, folks. And it wasn’t built with magic fairy dust, either. If this is your business, your livelihood, or your personal brand, it should be worth putting in the time to familiarize yourself with an intimidating user interface. Once you make friends, you’ll be buds for life. I promise. WordPress is supreme when it comes to website building — for blogs, online stores, or portfolios. The second slam on WordPress is its security. Because the software is open-source and the core code and any plugins you choose to implement have to be maintained, there’s ample room for error. Fortunately, it’s predominantly human error you’re battling, so you have some control. When WordPress updates roll out, implement them; vet your choice of plugins by reading reviews, and stay on top of those updates, too. Live by those few rules, and your WordPress security should be top-notch. What’s more, many of the web’s leading WordPress hosts have come out with WP-centric optimizations for security and speed. With WordPress, you get an army of web-building aficionados. It’s a good family to join. Unlike WordPress, Wix is heralded for rolling out the welcome wagon for non-coders and first-time site owners. All of the features we’ve touched on for blogging and online stores — the industry-specific themes, the drag-and-drop editor, the full-fledged host hidden in a browser-based platform — point to Wix as a beginner-friendly site builder. On the other hand, those who do expect to be able to graduate to moderate levels of custom CSS and HTML tricks get frustrated with Wix’s limitations, and rightfully so. The most hands-on site-building route available to Wix users is via the library of wireframes, or blank templates, which allow you to start from scratch on design (no predefined images or color palettes). Here’s where we have to draw the line. Hands down, Wix can’t compete with the likes of InMotion, DreamHost, and SiteGround, three renowned hosts in the WordPress space. Remember, the WordPress software by itself is called a “self-hosted” solution for a reason. The quality of WordPress hosting depends on the service provider with which you choose to partner. Not to end on a flat note or anything, but this final battle round is a tad anti-climatic. WordPress doesn’t have a run-of-the-mill support team on call around the clock. The code is written and maintained by contributors, and since you’re not paying them for a service, you’re at the mercy of their schedules. Fortunately, the sheer number of active community members means a quick Google search or a post in the WordPress support forums will get your needs met pretty quickly. I find the WordPress Codex to be an especially useful resource when I’m having trouble with my code or a seemingly software-specific bug. Generally speaking, this is another area where it pays to have a true web host, rather than a browser-based web builder. Most WP hosts tout 99.9% uptime rates or better, round-the-clock network monitoring, and an esteemed team of experts on staff to assist you. Some even handle updates to the WordPress Core and/or plugins. Wix offers the basics: 24-hour technical support via phone and email and a library of knowledgebase articles and FAQs. You’re not going to find the elite uptime rates and attentive network monitoring promised by conventional web hosts, but chances are, any Wix query you ask has been asked and answered before. Fret not. WordPress! Unless you are just interested in a free virtual playground to test the waters of website building, go WordPress. Wix is fine for creating very basic websites with fewer than fives pages, but WordPress will last you for the long haul. If you have conflicting thoughts on WordPress, Wix, or website building in general, we’d love to hear from you. Give us a shout on Twitter or using the Disqus comment form below.